Want to take your listings on HVmusic to the next level of visibility? Then consider our sponsored listings. Always appear at the top of their listing page, so you know that our visitors will see you. Are featured on the HVmusic home page. We charge for the length of time your listing remains a sponsored listing. Simply tell us how long you want your listing to be upgraded to a sponsored listing. 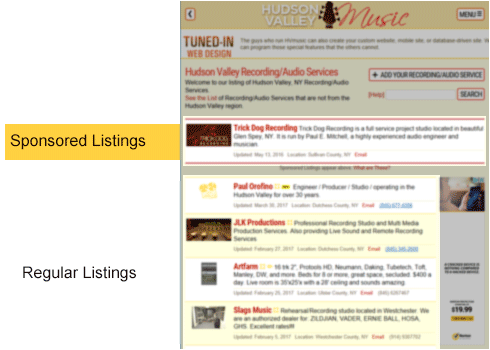 Receiving over 18,000 unique visitors per month, HVmusic.com is a leading resource in the Hudson Valley music community. OK, I'm Interested. Now What Do I Do? Click on the "sponsor" link next to the listing you would like upgraded to a sponsored listing.